Ryan exits his old, smoke-free office. This isn’t the first office ruined by Boehner’s heavy smoking. As the New York Times notes, when Representative Nancy Pelosi lost the speakership in 2010 and traded offices with Boehner, the House superintendent decided to repaint the room and replace the fabrics. Pelosi hadn’t requested the taxpayer-funded project. “We are all paying the price for Speaker Boehner’s smoking,” her spokesperson said. Ryan’s new office will get a more thorough scrubbing and a new carpet at some later date, but he’s already taken care of another deep cleaning project. On Monday, the portrait of former House Speaker Dennis Hastert was removed from its prominent spot in the Speaker’s Lobby, just behind the House chamber. Last week Hastert pleaded guilty to hiding financial transactions, which federal officials say were part of the $3.5 million he paid to a former student to keep quiet about sexual-abuse allegations. The painting was replaced by a portrait of Frederick H.G. Gillet, who was speaker from 1919 to 1925. 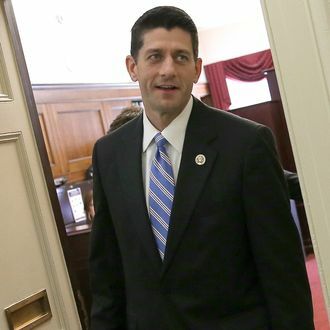 “The speaker believed it was appropriate to rotate in a different portrait,” said AshLee Strong, Ryan’s spokesperson.